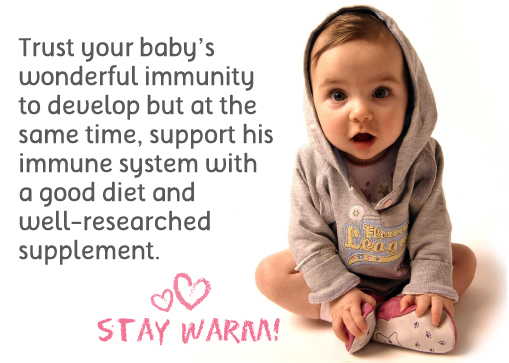 Your baby is born with a natural immunity that is passed on to him during pregnancy. This wonderful immunity in combination with the antibodies found in colostrum and breast milk protects your baby from illness to a great extent for the first 6 months of life. Over the next few years, your child will be working at developing his immunity so that he can face the germs he will be exposed to in life, without becoming too ill. The best way to boost your baby’s immunity in the first year is to breastfeed. Even once your baby is on solids, breast milk continues to carry some of your antibodies to your baby. The most important boost of your baby’s immunity is inoculations against dangerous childhood illnesses, such as tetanus, meningitis and whooping cough. If your baby is a fussy eater (common in the toddler years) it is a good idea to offer a natural supplement, which is best absorbed by the body and provides a wide spectrum of nutrients to ensure that your little one gets everything he needs. Bio-Strath is a natural supplement that provides essential vitamins, minerals and amino acids in an optimal form, to support your little one’s immune system as well as benefit their overall development. In addition, a multivitamin for babies and young children, with Vitamin C and Zinc can help boost immunity. Once your little one is attending crèche or school, he is likely to catch at least 8 infections per year. The next time he is exposed to the same virus the illness is much less severe. This is why children tend to get better and have far fewer infections after the age of 4 years. By this time they have been exposed to the vast majority of normally occurring viruses and the immune system has memory for these viruses.